Allstate and the American Football Coaches Association (AFCA) have tallied the college football fan votes and have named Notre Dame tight end Nic Weishar as the official 2018 AFCA Good Works Team® captain. Weishar was named to the team back in September for his commitment to community service and giving back off the field. For 27 years, the Allstate AFCA Good Works Team has highlighted the inspiring stories of selflessness demonstrated by college football players across the country who have dedicated their lives to positively impacting the world around them. The 2018 Good Works Team consisted of a final roster of 22 award recipients and one honorary head coach – 11 players from the NCAA Football Bowl Subdivision and 11 players from the NCAA Football Championship Subdivision, Divisions II, III and the NAIA – that were selected from this year’s 169 nominees. Of the 22 Good Works Team members, Weishar received the honor of being named Good Works Team® captain through fan voting that took place throughout the season at ESPN.com/Allstate. Weishar is Notre Dame’s eighth player to be named to the Allstate AFCA Good Works Team and the school’s first to be named Good Works Team® captain in the history of the program. Fans can tune in to see Weishar recognized as Good Works Team® captain during the live broadcast of The Home Depot College Football Awards Show airing on ESPN on Thursday, December 6 at 7 p.m. ET 6 p.m. CT.
Weishar’s story of community service excellence is one that embodies a very personal connection and motivation. In 2013, Weishar’s 21-year-old brother Andrew passed away after a three-year battle with cancer. In the aftermath of his brother’s death, Weishar fulfilled his family’s promise to his brother to pay it forward by starting the Andrew Weishar Foundation to give back to families with adolescents or young adults stricken with cancer. The foundation aims to provide cancer patients and their families with a temporary escape from the disease through acts of kindness and generosity while also aiming to ease their financial burden. To date, The Andrew Weishar Foundation has aided more than 100 families affected by cancer and granted more than $600,000 in financial assistance. 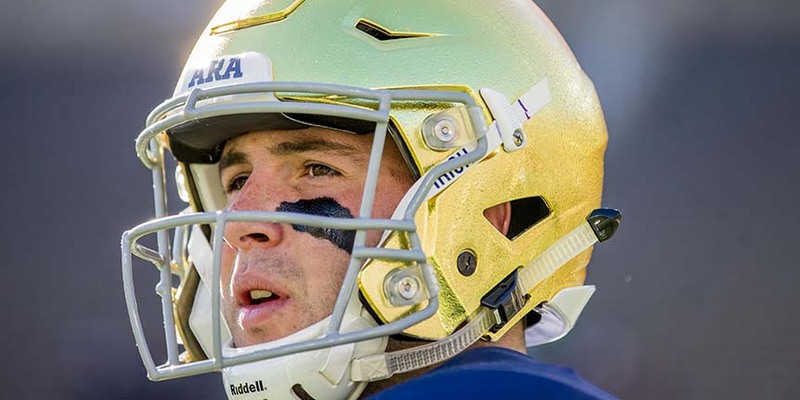 In addition to the work Weishar does with the foundation, he also led the Notre Dame football team in community service hours during the 2017-2018 academic year. Weishar and his fellow Allstate AFCA Good Works Team members, including honorary head coach Larry Kindbom of Washington University-St. Louis, have been invited to New Orleans, where they’ll join forces to give back together during a special volunteer project prior to the 2019 Allstate® Sugar Bowl®. The players will also be honored on the field at halftime during the game on January 1, 2019. Fans are encouraged to visit ESPN.com/Allstate to learn more about this year’s team members and their extensive community service efforts.